A farm at Lower Reule near Newcastle in Staffordshire has started construction of a £3m anaerobic digestion plant, due to be finished later this year. It will supply 1.3MW of energy to the National Grid every year as well as providing a way of dealing with up to 30,000 tonnes of food waste. Inside the farm's newly constructed anaerobic digestion plant the waste is converted into electricity and a nutrient rich bio-fertiliser, or "digestate". It is expected to produce electricity enough to power 1300 homes, and 13,500 tonnes of bio-fertiliser a year, which is made from Newcastle-under-Lyme Borough Council's food waste, everything from tea bags and banana skins to egg shells and chicken bones, instead of fossil fuels. The biogas from the AD plant will be burned in a combined heat and power plant, with the heat to be used to extend the growing season for crops on the farm - either strawberries or asparagus. Ian Critchley, director of Lower Reule Bioenergy, said: "The AD plant offers a very exciting diversification opportunity for the farm. Not only do we have products to use and sell in the form of power and biofertiliser, we also have excess heat available to extend our existing strawberry business or possibly set up another enterprise." 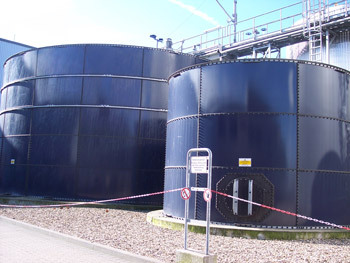 Lower Reule Bioenergy has been supported by a £750,000 grant from government waste reduction initiative WRAP. Louise McGregor, supply programme manager at WRAP, said: "Lower Reule Bioenergy provides a perfect example of the scope and versatility of AD as a sustainable business opportunity. "WRAP is committed to supporting this technology, which will not only help to divert millions of tonnes of biodegradable waste from landfill, but also help the UK deliver on climate change and wider environmental objectives." Trevor Nicoll, Head of Waste Strategy at Newcastle-under-Lyme Borough Council, said: "We've had a great response to our separate collections of food and garden waste with recycling rates jumping from 27% to 53% in the month they were introduced. "One of the reasons for this tremendous support is that people understand how their food waste is being recycled in the local area to create valuable resources and they are very supportive of the scheme." Dr Richard Swannell, Director of Retail & Organics Programmes at WRAP said: “We’re very pleased to be supporting Lower Reule Bioenergy. This new plant will be providing renewable energy and a valuable resource to local agriculture as well as diverting food waste away from landfill where it releases methane, a powerful greenhouse gas. 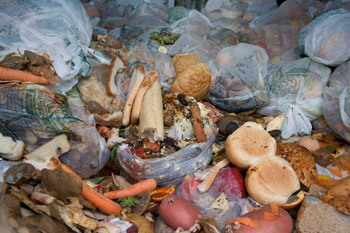 "It will help both local authorities and businesses in recycling their food waste, reducing their environmental impact and potentially reducing costs."